The right concealed carry jeans to wear to work or out with family or friends let you blend in while enabling you to stay prepared. Good tactical jeans are more covert than ordinary jeans, and they boast built-in features that improve CCW. This guide will help you figure out what to look for in the best women's tactical jeans for concealed carry. Back mag pockets that give you plenty of room for spares. Reinforced belt loops that can support a belt with a holster. Riveted, reinforced pockets that won't tear with normal use. Extra-deep change pockets that give you room to stash a tactical knife. Stretch denim that allows you to move freely to chase a suspect, run from target to target during training or sit comfortably when you need to. Comfortable waistbands designed to stay in place without pinching or constricting you. Ripstop fabric that can stand up to snags. Women's tactical denim jeans need to fit properly so you can stay comfortable enough to respond to an emergency. Every pair of concealed carry pants has its own fit, so here's a list that covers what you need to know about each style. Concealed carry skinny jeans. Thesemid-rise CCW jeans fit tightly from the hip to the leg opening. Slim cut tactical blue jeans. Slim tactical jeans feature a medium rise with a moderately snug fit from the hip to the thigh. From the knee to the leg opening, the fabric is cut straight. Straight leg tactical jeans. Straight leg jeans feature a medium rise with fabric that's cut the same size from the hip to the leg opening. Bootcutconcealed carry jeans. Mid-rise boot cut tactical jeans have a straight fit through the hip and thigh, while the fabric from the knee down is cut a little wider. Relaxed fit tactical jeans. Relaxed jeans feature the most generous cut of fabric in the hip and thigh areas with a straight cut from the knee down. Well-made concealed carry jeans can support the weight of a tactical belt without sagging at the waist – but you can attribute some of that to the fit and size you choose. Match your measurements to the appropriate 5.11 sizing guide if you're not positive what's right for you. 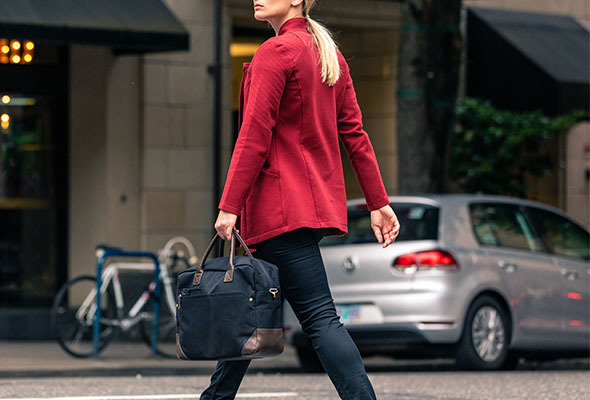 Pair them with a tactical top and the right women's footwear for your day on the beat, at the range or at work to create a head-to-toe tactical outfit that won't hold you back from getting the job done.